It's no wonder government workers in Wisconsin are so touchy about having their benefits and negotiation privileges curtailed. 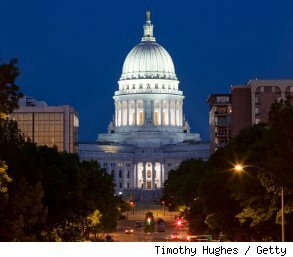 A recent article in USA Today reports that Wisconsin is one of 41 states where public employees earn higher-than-average pay and benefits as compared to private workers in the same state. Now here is the surprising news! Government workers in Wisconsin have only received marginal raises over the past 10 years, and their compensation is still below the national average for non-federal public employees. What increases Wisconsin government workers have seen basically come in the form of the increased value of the benefits they receive. And those are the very same benefits Wisconsin Governor Scott Walker is looking to reduce. He's in the midst of proposing a budget for the year beginning July 1, which involves limiting collective-bargaining rights of public workers and requiring them to pay more for their benefits. Walker predicts that many state workers will soon lose their jobs entirely if the budget isn't passed by the State Legislature. Talk about being caught between a rock and a hard piece of cheese! To give you an example of what happens in states where public workers have severely limited rights to organize, Texas ranks last in benefits for public employees, and hasn't granted cost-of-living increases to most retirees since 2001. Also, public workers in Texas earn less than their counterparts in the private sector. And yes, public workers in Texas are now demonstrating in solidarity with their brothers and sisters in Wisconsin.